Mass of Christian Burial for William E. “Bill” Miller, age 95, of Chapman, will be 11:00 a.m. Friday, November 9, 2018 at the St. Michael Catholic Church in Chapman with Father John Wolesky as Celebrant. Mr. Miller passed away Sunday, November 4, 2018 at the Geary Community Hospital in Junction City, Kansas. He was born April 25, 1923 on the family farm in Neosho County, Kansas, the son of Walter Joseph and Lourene Olive (Peak) Miller. Bill attended local schools and served his country in the United States Army during WWII. He worked in civil service at Ft. Riley until his retirement and was a member of the St. Michael Catholic Church, and the American Legion Post #240, and NARFE. Bill also enjoyed going to auctions, fishing, and watching bull riding. On August 9, 1947 Bill was united in marriage to Betty G. Burk. She passed away January 18, 2010. He is survived by his sons Chris Miller of Chapman, Kansas, Tim Miller (Karin) of Wichita, Kansas; daughters Carole Skibbe (John) of Alpharetta, Georgia, Jeanne Murray (Dan) of Tuscan, Arizona; daughters in law Margie Miller (Larry) of Abilene, Kansas, Terry Miller (Steve) Chapman, Kansas; sisters Hazel Cussimanio of Girard, Kansas, Mary Boor of Mulvane, Kansas, Marie Kasparek of Oklahoma City, Kansas; eleven grandchildren and eighteen great grandchildren. He was preceded in death by his loving wife Betty; sons Laurence and Steven; brothers Walter Jr, Louis, Robert, Edward, and Kenneth. Bill’s final resting place will be in the St. Patrick’s Cemetery in Chapman. A parish rosary will be recited at 6:00 p.m. Thursday evening at the funeral home in Abilene with the family receiving friends following. 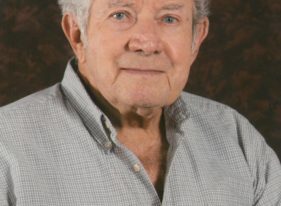 Memorial contributions may be made to the St. Patrick Cemetery Fund and may be sent in care of the Martin-Becker-Carlson Funeral Home, 414 NW 3rd, Abilene, Kansas 67410. Condolences may be sent to the family at www.martinbeckercarlson.com.